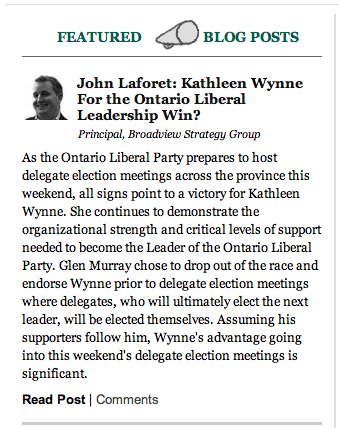 » John Laforet: Kathleen Wynne For the Ontario Liberal Leadership Win? Broadview Strategy Group’s Principal, John Laforet wrote an article for Huffington Post Canada with his analysis of the Ontario Liberal Party leadership race. John outlines why he thinks Kathleen Wynne will be the next Liberal Leader and Premier. If you’re interested in campaigns, you will enjoy this read. Below is an excerpt from John’s article and a link to the complete piece. John Laforet: Kathleen Wynne For the Ontario Liberal Leadership Win?